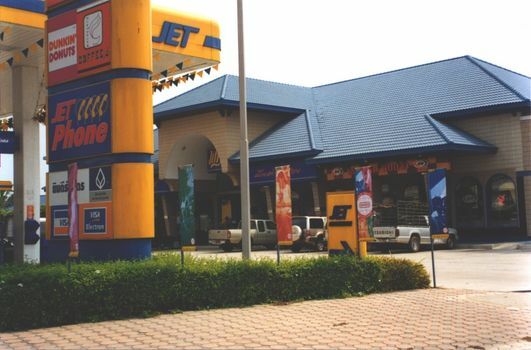 Bangkok is the last of a line of Thai capitals that goes back through Ayutthaya and Sukhothai to Chiang Mai and beyond. It was also the first Thai capital established by a monarch who recognized that Thailand had to become more Western if it was to survive as an independent state surrounded by European colonies. Two centuries later, when Bangkok has over seven million people, a king is still on the throne, and Thailand continues to draw on Western technologies, institutions, and values. The city was established in 1782, 15 years after the Burmese had destroyed Ayutthaya. (Ironically, the name Ayutthaya in Sanskrit means "invincible.") Perhaps it was easier to start anew than to rebuild; the new city, closer to the sea, would also make it easier to communicate with the foreigners who would soon be playing a major role in the development of the country. 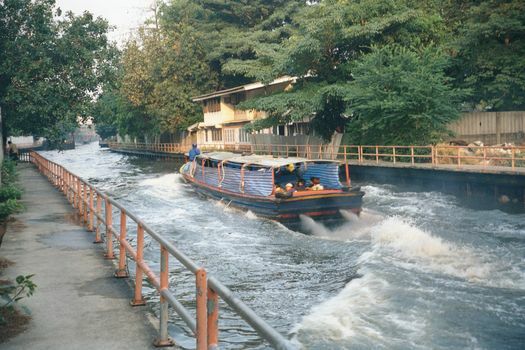 The site chosen for the new city was on the left bank of a wide curve of the Chao Phraya River, and it was protected on the east by two concentric moats. 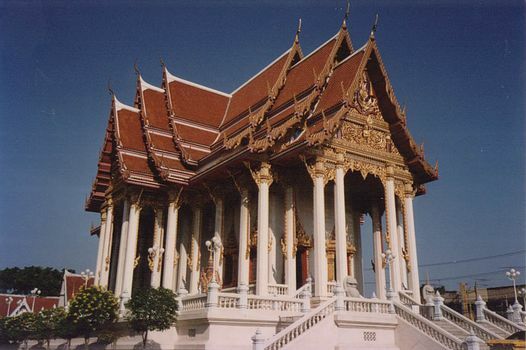 A grand palace would be built at the center of the new city, properly called Krung Thep or "City of Angels." 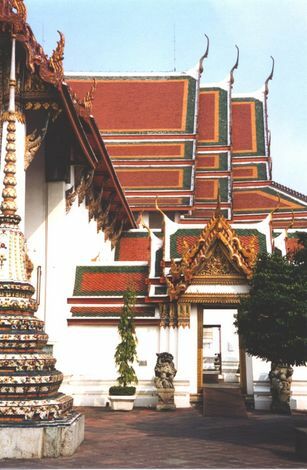 That was the short form of the much longer formal name, which included the phrase "the Happy City Abounding in Great Royal Palaces which Resemble the Heavenly Above Wherein Dwell the Reincarnated Gods..." Even now, the core of Bangkok, bounded by the moats, is known as Ko Rattanakosin, "the emerald island of Indra." 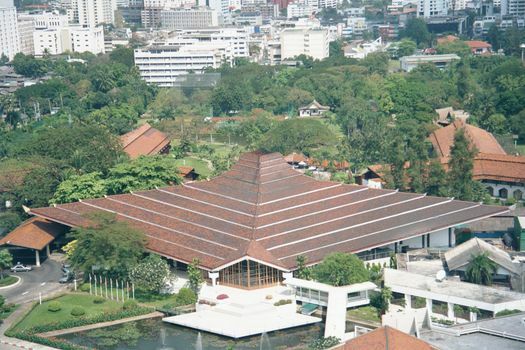 The inner part in particular, dominated by the palace, has been restored to pristine shape since the 1980s and the discovery at that time of Moradok Thai, "Thai heritage." 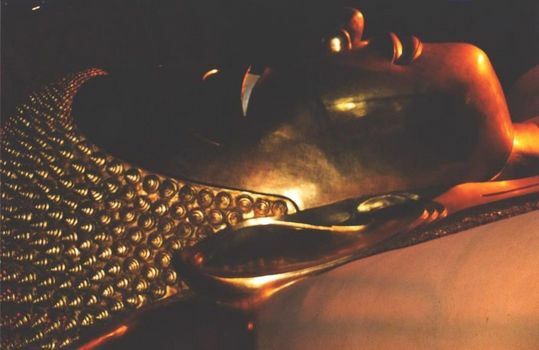 Rama I began the dismantling of the divine kingship of the past, which had so elevated the king that commoners could not even speak of him directly. This demystifying process waxed and waned until the bruising revolution of 1932, when the monarchy was temporarily displaced and eventually restored in a constitutional form. 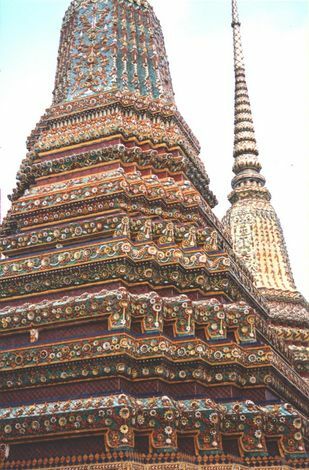 Still, the iconography of the Grand Palace reinforced even a human king's power, as did the grandeur of the many temples. A good example is Wat Po (or Pho). Adjoining the Grand Palace, it's not so very old, but it became Rama I's royal temple. 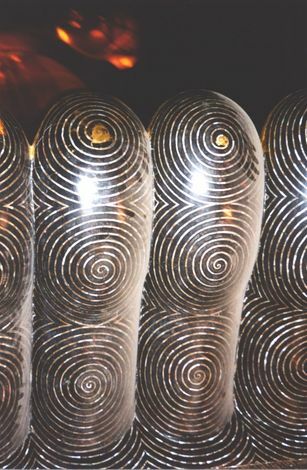 The name wat comes from a Sanskrit word for a "dwelling for pupils;" po, from Sanskrit bodhi, "enlightenment." The multiple gables indicate high rank. 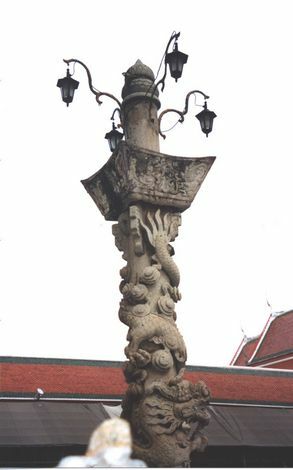 The distinctive chofa finial represents the head of Garuda, the half-man and half-eagle who is the mount of Vishnu and associated with the Thai monarch. 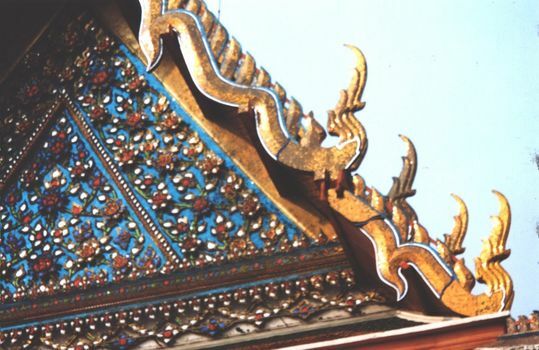 Garuda's wings are represented by the end boards of the gables. The hang hong ("swan tail") finials rising lower on the gables represent the heads of serpents, nagas, seized by Garuda; the comb-like teeth of the end boards (bai raka) represent naga scales. In short, the king seizes his enemies. Inside the bot or assembly hall (Sanskrit chaitya) at Wat Po. 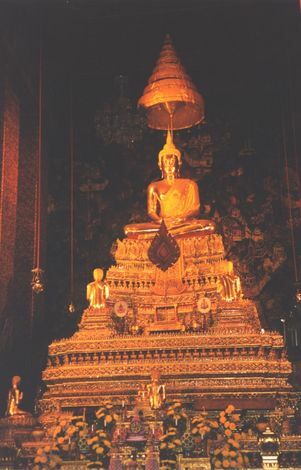 Rama I's ashes are under the image of the Buddha, which is of gilt bronze. 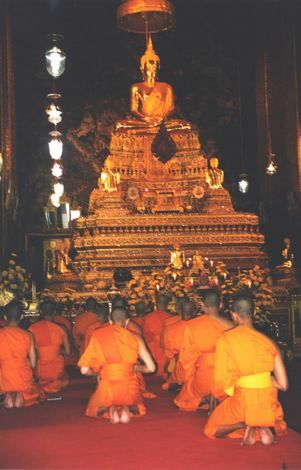 Images of Buddha's eight disciples are on the altar tiers. Wat Po is still very active: monks chanting. 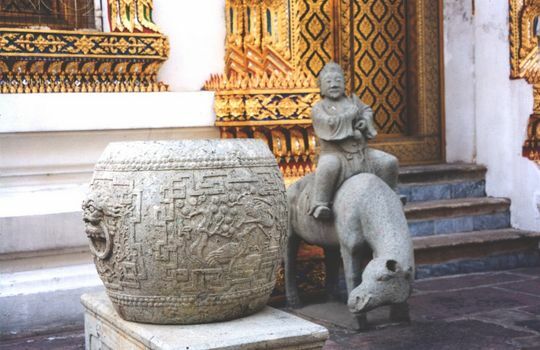 Outside the bot is a set of chedis, stupas commemorating Thai kings. Four stand in this cluster: they include a green one built by Rama I and on the axis of the bot, two white and yellow ones by Rama III and a blue one by Mongkut, Rama IV. 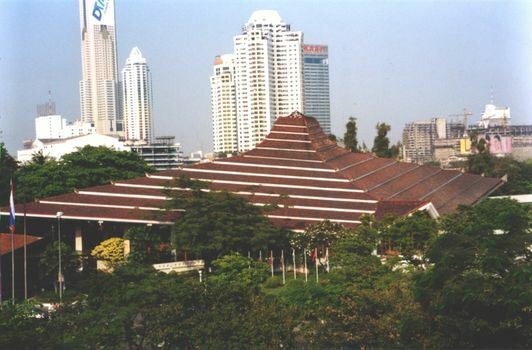 A vihara or image house at Wat Po contains a 46-meter reclining Buddha. 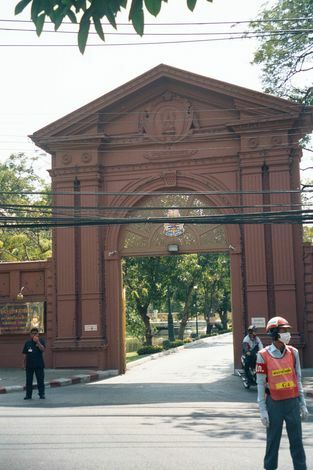 Although Bangkok recreated Ayutthaya in a new location, Chinese influence was strong. King Taksin, Rama I's predecessor and the man responsible for moving the Thai capital down-river from Ayutthaya, had been half-Chinese. He had encouraged Chinese to settle in Bangkok--the flow wasn't checked until 1929--and they clustered primarily in Sampheng, Bangkok's Chinatown. 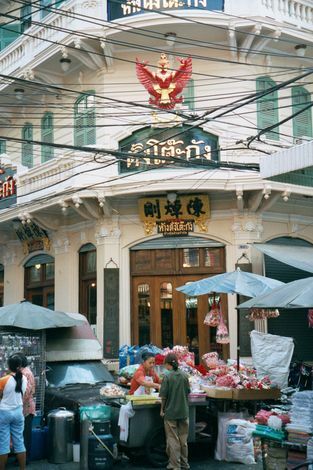 Trade with China has been a staple of Bangkok ever since. 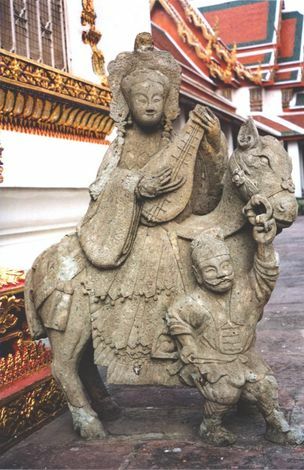 Here, a Chinese camel at Wat Po. Also on the grounds, a Chinese lantern. Music to ease a journey. 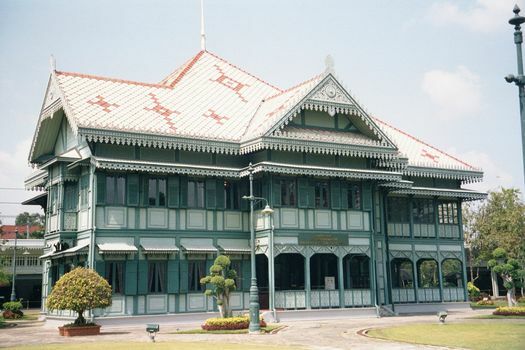 On the Dusit Palace grounds, the comparatively modest Suan Hong residential hall was built in 1902-1910 for the king's grandmother. 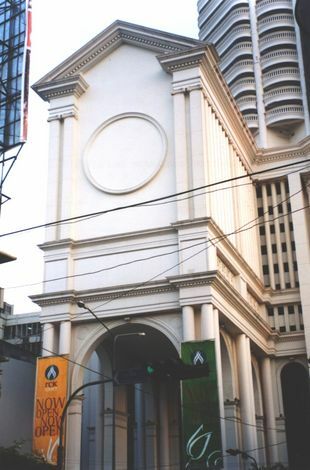 The present structure is a reconstruction from old photographs. 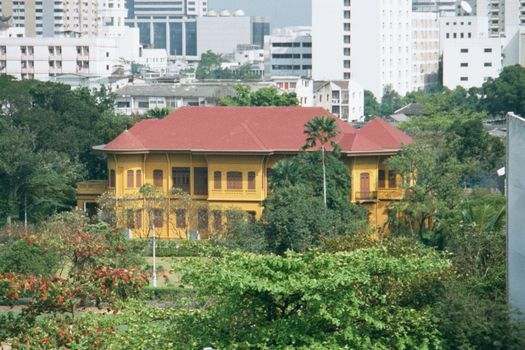 Also on the Dusit grounds, the Vimanmek Mansion, built by Chulalongkorn (Rama V) in 1900 for his own use. 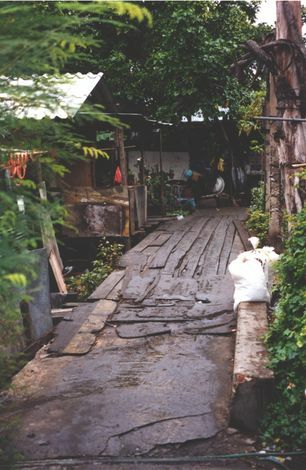 The yellow-teak timbers were taken from an incomplete provincial palace on Si Chang Island. 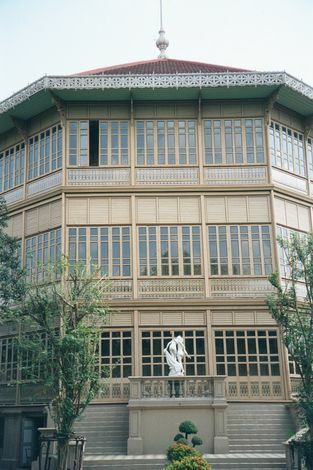 Rama V lived in this octagonal wing. 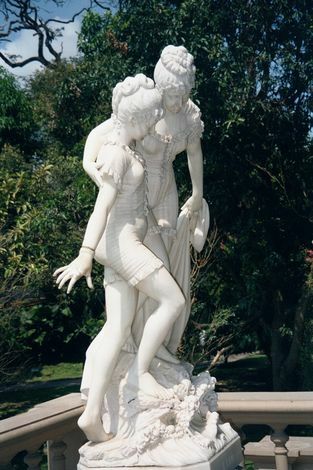 An Italian sculpture stands on the terrace. A close-up of "Al Lido," an expensive bit of titillating frippery. By mid-19th century Bangkok had perhaps 100,000 people, of whom about half were Chinese. By 1913 it had 365,000 people, thanks largely to continuing Chinese immigration. Europeans began settling after 1855, when King Mongkut (Rama IV) signed the Bowring Treaty, the first of several treaties stimulating European trade. Here's part of the result: commercial buildings in what's called the Old Bangkok style, which to all appearances is a Dutch colonial style. 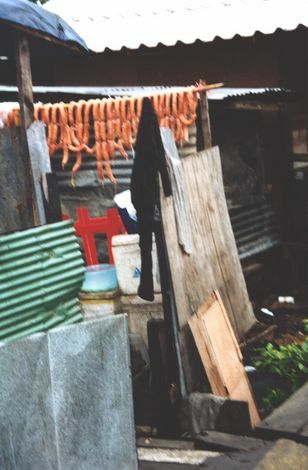 The photo was taken in Bamglamphu, just north of the Grand Palace. Some merchants from that century are still in business, like Tang To Kang, a gold shop at the corner of Sampeng Lane and Thanon Mangkon. 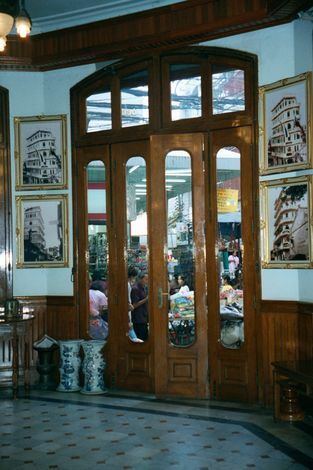 The interior of the store, whose owners are well aware of its history. 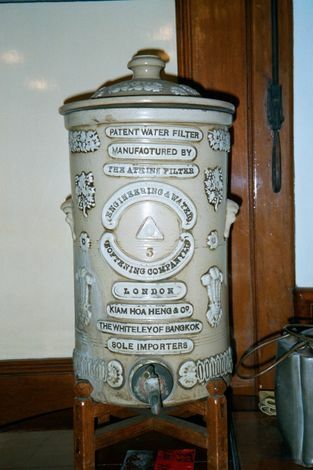 A drinking-water filter and dispenser. 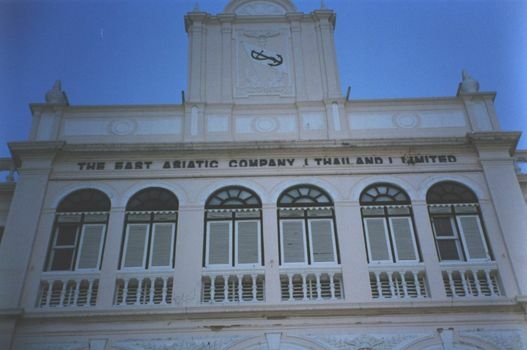 The river-facing facade of the East Asiatic Company, established in 1884 by H.N. Anderson, a Danish sea captain. It's still listed on the Copenhagen stock exchange, but its headquarters are in Singapore, where it operates a logistics and supply-chain-management company. 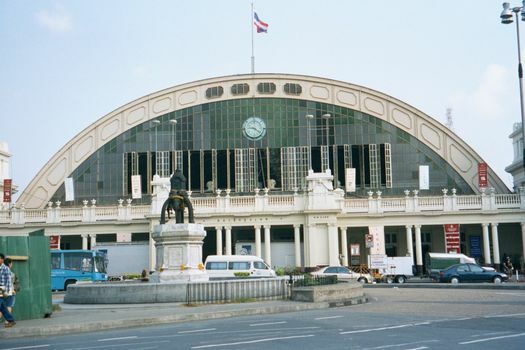 Bangkok's railroad station was designed by Dutch architects just before World War I and is a good deal grander than the same-vintage station the Dutch built for themselves in Batavia, now Jakarta. 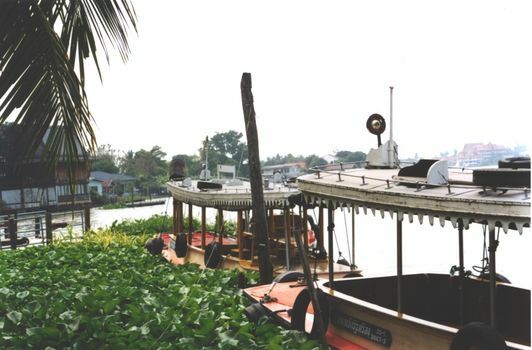 As late as 1930, Bangkok was a compact place, but the city had already outgrown its original outer moat, which corresponded to the modern Khlong Ong Ang. 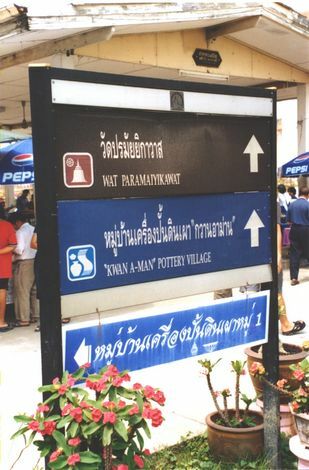 A new boundary was created in 1854 with the opening of the Khlong Krung Kasem, to which the railway station is tangent. By 1930 the city had spread east to this new limit but also south along the riverfront, where Rama IV had ordered the creation of the first road in the city to penetrate beyond Rattanakosin. 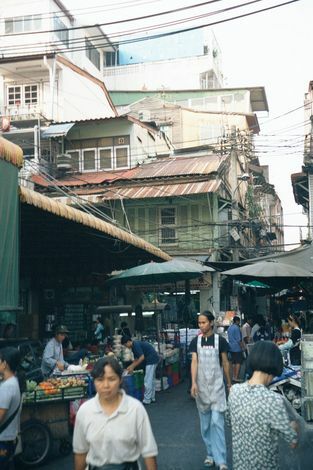 This was Charoen Krung ("prosper the city"), long known simply as New Road--and crowded ever since. 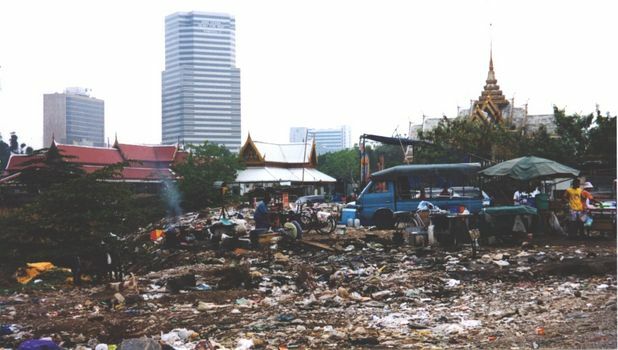 It led to Sathorn, where most Europeans lived. 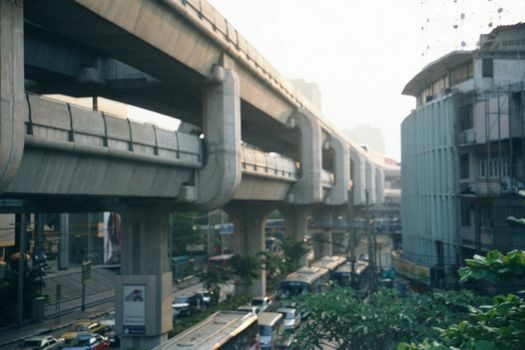 The scene here is of the Bangkok that grew after 1930 to the east, on land that had been rice paddies The newest thing in the picture is the "skytrain" over Thanon Rama I, now darkened by this product of German engineers. 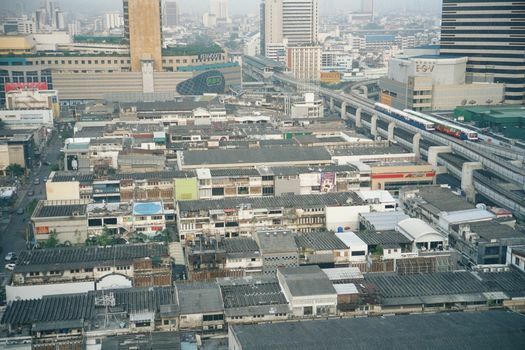 To the left and occupying most of the frame is Siam Square, a very popular shopping district built in the late 1960s on land leased from Chulalongkorn University, off to the left of the picture. In the distance is the massive block of the Mahboonkrong Center, Bangkok's first multi-story shopping center--and no place for anyone with a tendency to claustrophobia. Pedicabs are long gone--banned in 1959 as "unsightly." 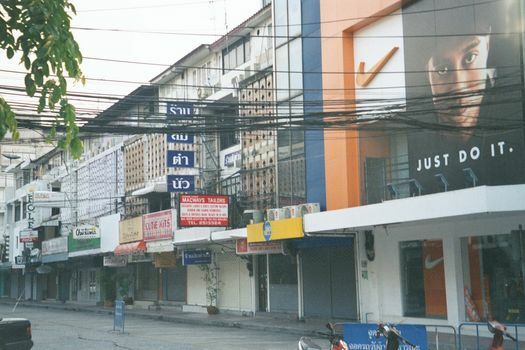 Looking east from Siam Square along the line of the skytrain and away from the old city: more shopping and hotels. Between 1964 and 1970--say, the period of the Vietnam War--the number of hotel rooms in the city more than quadrupled, growing from about 2,000 to over 8,700. 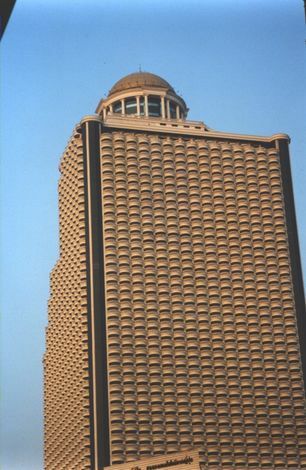 By 1990, the city had 130 luxury hotels. The skytrain, opened in 1999, did not prove a financial success: ridership wasn't high enough, perhaps because the system didn't go far enough. Down below, the streets seem hardly less congested than they were before the skytrain's construction. 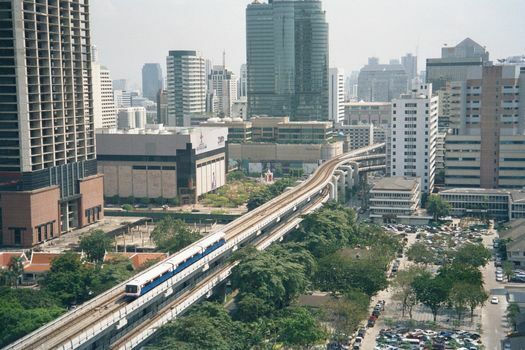 Again from the Siam Square station, this time looking northward toward a proud skyline, but one with lots of towers left nearly empty when Thailand struggled to right an economy that had almost sunk in a financial crisis of 1997. 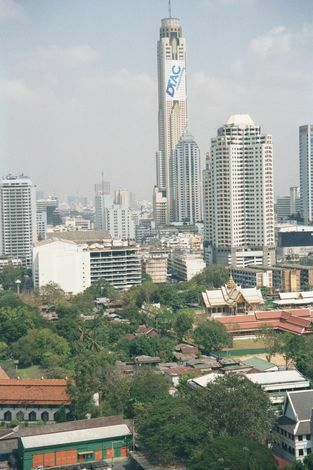 In the background, the 85-storey Baiyoke II tower, designed by Plan Architect but lacking the intended 140-meter communications tower; in its place is a billboard advertising DTAC cell phones. 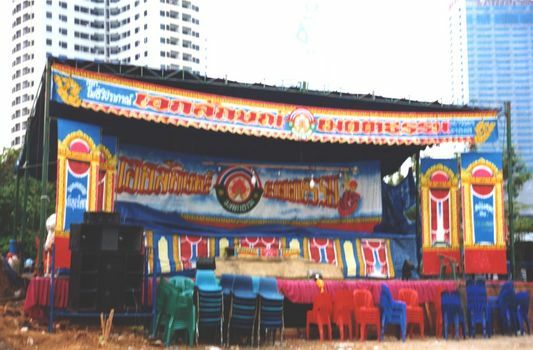 Right center, the Wat Padum Vanaram. Almost invisible in the greenery is a squatter settlement tucked into the urban patchwork. Street level at Siam Square. It's early in the morning and misleading: later in the day the neighborhood is so crowded you don't notice the apartments upstairs. You can't miss Tiger, though. Good thing, too: Nike paid him $100 million to endorse their shoes. 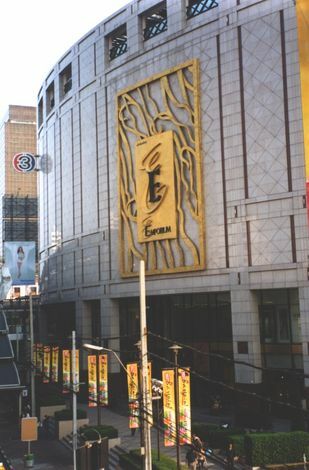 Thirty years after Siam Square, the Emporium Shopping Center, five skytrain stops to the east, was the city's flashiest mall. 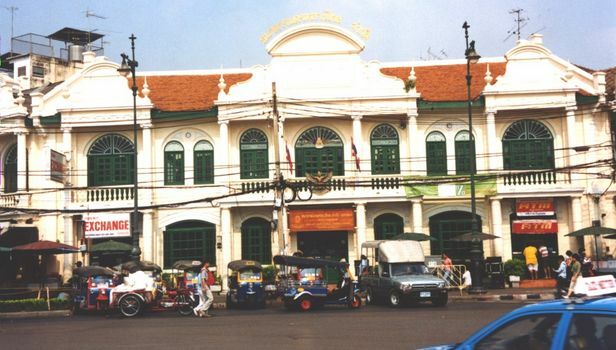 North of Siam Square and just across Rama I lies the anachronistic Srapathum or Lotus Pond Palace. 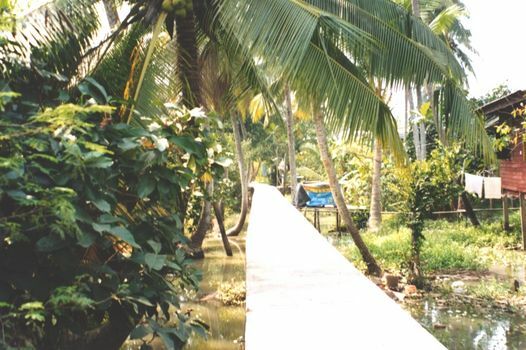 It takes its name from the flowers that were common when this was a country house surrounded by rice paddies. 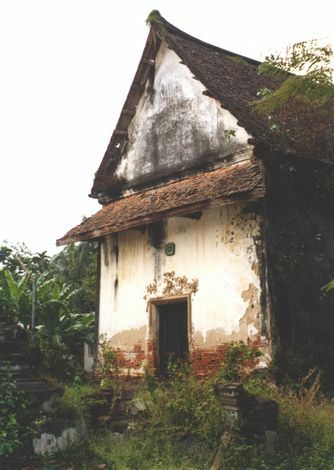 This was the home of the father of Bhumibol Adulyadej, Rama IX. It was the site of his son's wedding in 1950, and it was the home of the Princess Mother until her death in 1995. 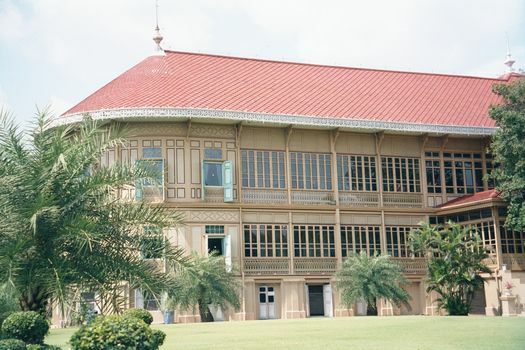 It then became the home of the king's daughter, Princess Maha Chakri Sirindhorn. The palace originally sat on a 43-acre royal estate. 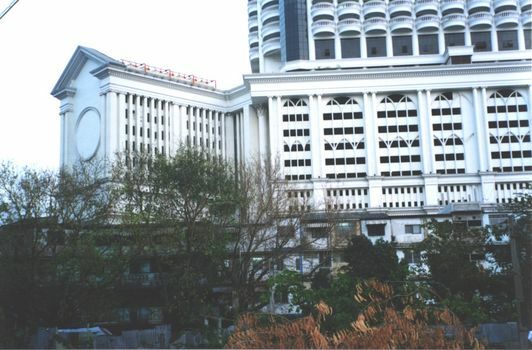 Twenty-six of those acres were leased for the Siam Intercontinental Hotel, which was designed by Joseph Salerno and opened in 1964. The roof imitated a royal hat and was considered offensive for many years. 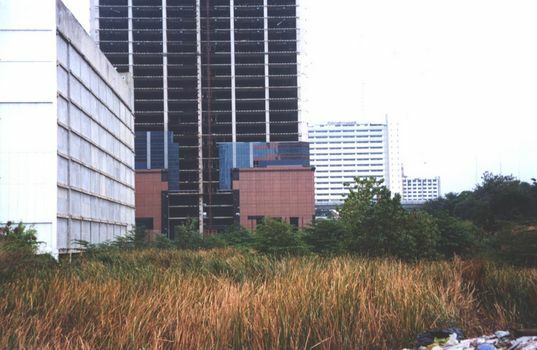 People eventually grew to like it, but real-estates values usually trump sentiment, and the hotel was demolished in 2002 to make way for the Siam Paragon shopping center, along with a new hotel. You couldn't keep highrises at bay indefinitely. Meanwhile, the Khlong Saen Saeb continues to pass north of the palace grounds. It's one of the few khlongs not filled in. 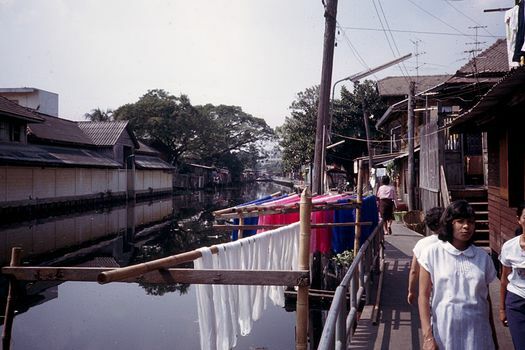 As recently as 1981, when this picture was taken, hanks of freshly dyed silk were hung out to dry along the khlong. Twenty years later, the canal survived but the sidewalks were entirely concrete, instead of at least partly wood. The silk dyers are gone. Canal boats rush by with such frequency that the water doesn't have time to grow still. 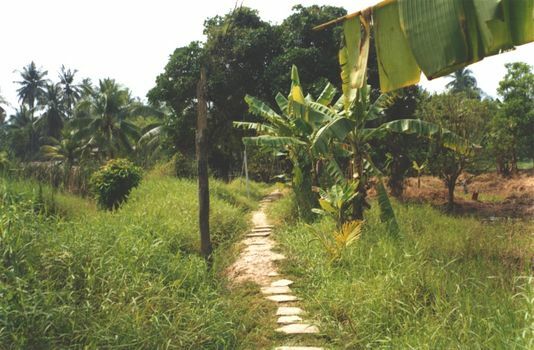 This is the main path into the squatter settlement just south of the khlong and east of the palace. 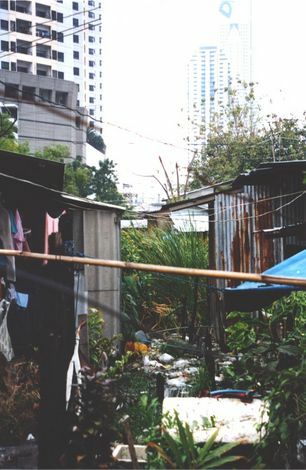 (This is the same squatter settlement seen in the northward view from Siam Square station.) 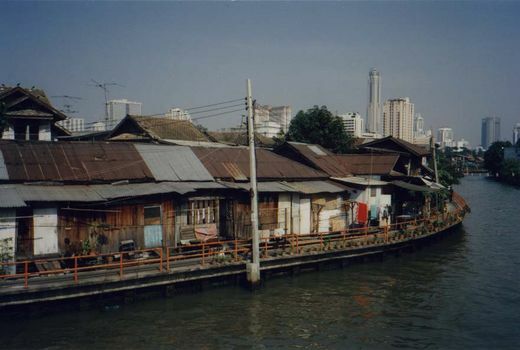 Despite efforts at slum clearance, Bangkok had some 1,744 slums in 1992, and they housed about a million people. The largest, with 75,000 people, was downstream, at the port community of Klhong Toei. City officials later abolished the slums by formally renaming them "crowded communities." Presto! Families live in these settlements for decades, though there's usually someone in the household who was born in a distant village. 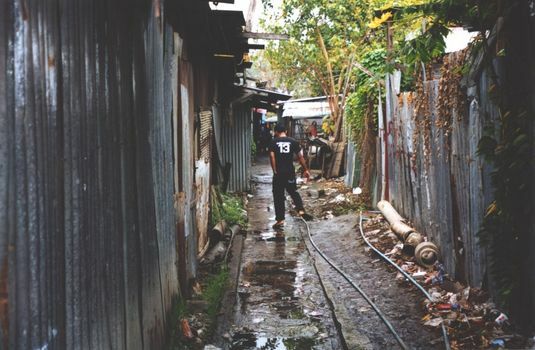 Most of the people have jobs as laborers, but not everyone in these slums is poor. 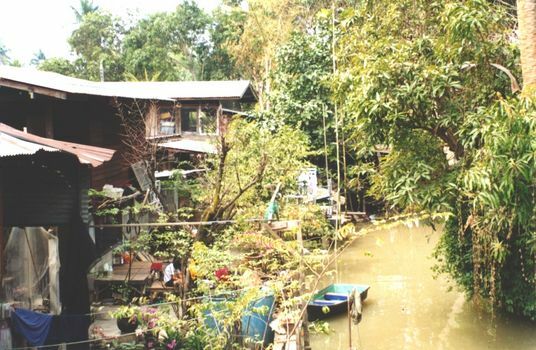 Marc Askew's Bangkok: Place, Practice, and Representation (2002) reviews the evidence suggesting that a fair number of the residents could afford "regular" housing. It's an amazing juxtaposition with the air-conditioned towers nearby. 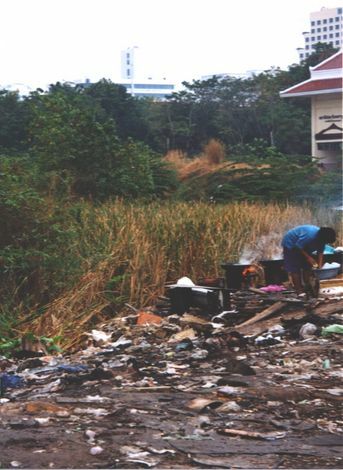 The slum adjoins both a dump and the venerable Wat Padum Vanaram. The dump is also the backyard of the World Trade Center, a shopping center that's open but limping from the bruising competition. Wedged in between the dump and the slum: a temporary stage. Meanwhile, developers try to out-do one another. 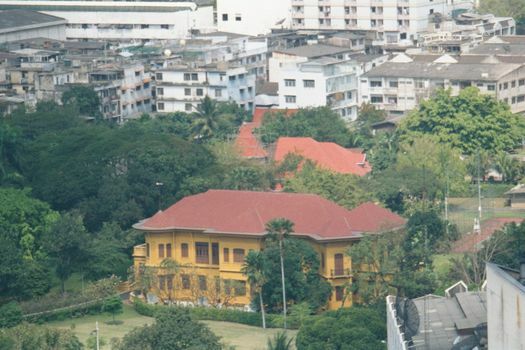 Along the southern waterfront, this is the Royal Chareon Krung (RCK) building, designed by Rangsan Torsuwan. The main entrance has a broom closet perched over the porte cochere and dressed-up as a little Parthenon. Or perhaps it's not a broom closet; maybe it's a vault stuffed with goodies from Louis Vuitton and Patek Philippe. 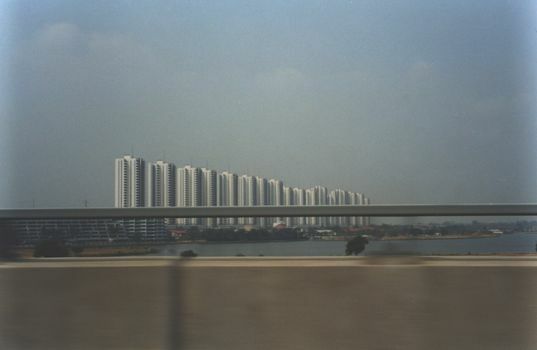 The city's northern and eastern fringes are rimmed with housing estates--mubanchatsan--both low and high. This picture of moon-colony highrises was taken north of the city and from the elevated deck of the imaginatively named Second Stage Expressway. Meanwhile the Chao Phraya provides efficient taxi service for those whose business is close to the river. Upstream a few miles, the ferries are modest. They not only cross the river but serve at least one remarkable island where for lack of bridges things are forced to slow down. 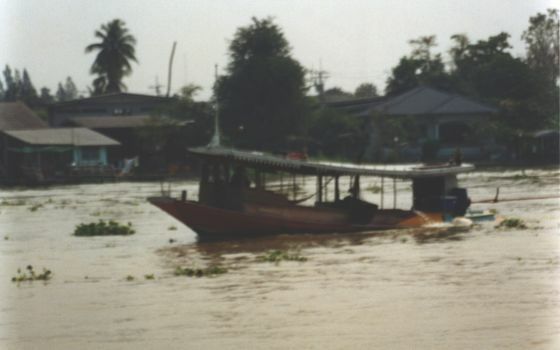 This is Pakkret, formed by a meander of the Chao Phraya and its cutoff. It's about a mile square and no more than five miles from the city's airport. Quite a change. On the island you'll find abandoned buildings like this. You'll find more crowded neighborhoods, too. What's the economy based on? Answer: locally made pottery, aimed at tourists who want a alternative to pressure cookers.